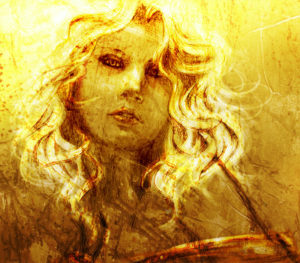 Sól is the much-revered goddess of the sun, and she was worshiped widely throughout Germany and Scandinavia. Her worship has ancient roots, and extends far back into the bronze age. In Eastern Europe she was known as Saulė or Saul, and is one of the principle deities in Latvian, Lithuanian and Baltic pagan traditions. Her epithets include “the shining god” and “Bright bride of heaven.” Also known as Sunna in Old High German, Sunday is named after her. Her companion is her twin brother Máni, god of the moon. Sól is worshiped in all Nine Realms, and has different nicknames accordingly: “Sun” by mankind in Miðgarðr; “Sunshine” by the gods in Ásgard; “Dvalinn’s Deluder” by the dwarfs in Svartalfheim; “Everglow” By the Jötnar; “Lovely Wheel” in Alfheim; and “All-Shining” by the Æsir. She is attested to in the Mersebrug Incantations, as well as the Eddas, Poetic and Prose. Her father is Mundilfari (also know as Alfrodull), a god of time. She is said to have a mysterious sister, named Sinthgunt, who may be a goddess of the morning star, Venus, or perhaps her daughter. Either way, in the charming tale, Sól and Sinthgunt help Óðin to heal Baldr’s horse from injury. Like their father, both Sól and Máni are gods of time, and together they help both gods and men account for the passing of the hours, days and years. They follow predetermined routes, assigned to them by the gods, and are continually chased by spirit wolves. Solar eclipses represent times when Sól’s wolf (Sköll) is gaining on her. It is prophesied that at Ragnarök, Sól will be caught up with and devoured by Sköll, or alternately Fenrir. Various speculations around what this might mean have been theorized as similar to a nuclear winter. In any event, Sól is further prophesied to give birth to a second sun: a daughter, also named Sól, who will take her mother’s power, and light the new world, Gimle. Sól thus bears close archetypal ties to the mythical divine bird, Phoenix of Persian mythology. In Grminismal, Óðin explains that there is a shield between Sól and the worlds below, and that without which, the earth and seas would otherwise burn up. In addition to Saulė of Baltic Europe, Sól was worshiped by the Celts, by the name Sulis, the goddess who presided over thermal springs, thought to be heated by the power of the sun. She further bears a resemblance to Amaterasu, the sun goddess of Japan, and of the course, the demi-goddess figure of the Phoenix, in Persian myth. She has the same roots as the Hindu goddess of the sun, Surya. Strangely enough, the Romans worshiped the sun god Sol as a male deity. According to some lore, Sól regards her eternal chase across the sky from the wolf that chases her to be a fun game. Sun and solar images. Flaming swords. Horse-drawn chariots, bellows, and wheels. Thermal springs, Summer, Midsummer, and the day Sunday. Gold. The rune Sól. Sunna, Sun, Sunnu, Gull, Surya, Sulis, Saule, Saul, Tsar, and Solniste.